If you somehow haven’t seen Big Fish since it’s release in 2003 then stop reading now (seriously, this will contain major spoilers). This film cannot be described in mere words, the only way to experience it is to immerse yourself in the delightful fantasy that is Ewan McGregor in the expert hands of Tim Burton for the 125 minutes it takes to tell its tale. 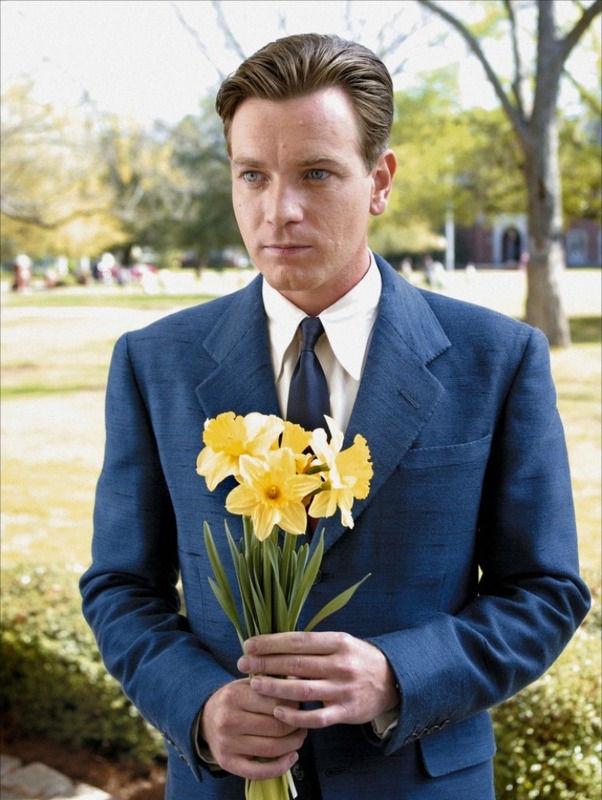 In addition to Ewan McGregor the film also features Albert Finney, Billy Crudup, Jessica Lang and Marion Cotillard. 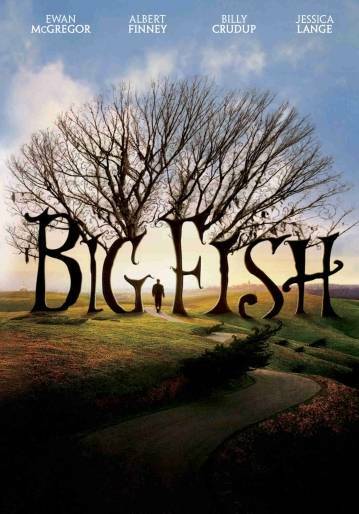 Big Fish was originally a novel written by Daniel Wallace and published in 1998. The film is narrated throughout by William Bloom (Billy Crudup), the son of Edward Bloom (Ewan McGregor as young Edward/Albert Finney as elder Edward). 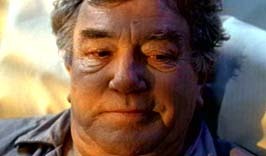 We meet William on his wedding day when his father Edward, in the present day played by Albert Finney, is giving a toast to wish the happy couple well. His toast involves a rather exciting story about what he was doing on the day William was born. This is a story William has heard many times before, so many times in fact he can recite it word for word as his father wows the crowd. The story is really quite a sweet tale about how Edward set out to catch an un-catchable fish, and no matter what bait he tried the fish would not bite. It wasn’t until Edward Bloom tied his wedding ring on to the end of the fishing line that the fish took the bait and ran with it. The moral to the story? If you want to catch un-catchable fish you need to offer it a ring. While the wedding party appear to enjoy the tale William feels that once again his father has stolen the lime-light by mesmerising people with lies. William grew up with his fathers tall tales and when he realised that none of them were true he discovered he had no idea who his father really was and all attempts to get to know the man behind the stories were futile. Cut to three years later and William has not spoken to his father since his wedding night. Edward’s failing health however brings William and his pregnant wife (Marion Cotillard) back to the family home. On their travels William tells his wife the tale of how his father looked into the glass eye of a witch as child and saw his own death. Upon their arrival at the family home the son and father tentatively begin to rebuild their relationship, one knowing that they don’t have much time left and the other knowing that his time on Earth is not quite finished yet. What follows is a final re-telling of the stories that have shaped Edwards life, from the story of how he happened upon the town of Spectre (with a nod going to to the wonderfully clever play on words) where Edward was expected to arrive but he was just a little early, to how Edward met his wife (played in the younger version by Alison Lohman and as the elder version by Jessica Lang). And if we may just pause for a moment in awe of how wonderfully captivating both Alison Lohman and Jessica Lang are in this role. Even for the least romantic at heart the story of how Edward works in a traveling circus in order to gain a snippet of information once a month about the love of his life is thoroughly captivating. When Edward finally earns the right to discover her name is Sandra Templeton he quickly tracks down the love of his life only to discover she is engaged to another. There are many iconic scenes in Big Fish, one of them being the scene where Edward Bloom fills the courtyard outside Sandra Templeton’s window with daffodils in an effort to win her affections. Their life together is quickly put on hold when Edward is called up for active duty. In an effort to get back home as quickly as possible Edward puts his hand up for the most dangerous of missions and when a mission goes slightly askew he is presumed dead. 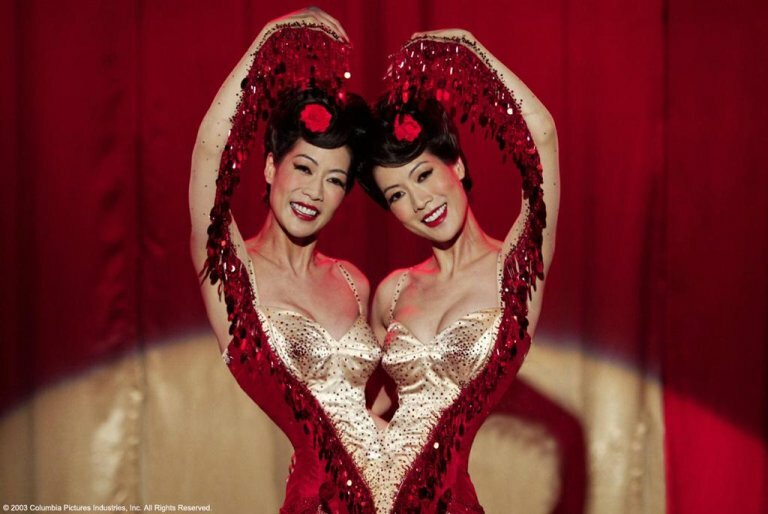 In the meantime however Edward meets conjoined twin dancers, Ping and Jing, whose song will be stuck in your head for days. After four nightmarish months for Sandra, Edward is finally returned to her arms. It becomes evident that William believes that his father has concocted a lifetime of stories to make up for his missing presence during Williams childhood and that William has assumed for many years that his father had another family somehwhere as this was the only logical explanation. Slowly, as Edwards health deteriorates and William sets out to prove his theory correct, William begins to realise that (in the words of his mother) “not everything your father tells you is a lie”. It is as Edward lies dying in hospital and insists his child tells him the story of his own death that William comprehends the man behind the stories. As Williams story gains gusto and they both see the events being played out in their minds-eye a transformation occurs and for the first time in a long time the two men are at peace with each other. It is only in passing that William begins to appreciate the legacy of the stories his father passed down to him as he recognises the various characters he spent his childhood hearing about attending his fathers funeral. And as Edward Bloom knew he would, William passes the legacy of the stories on to his own child.